Commercial trucks are the lifeblood of U.S. society. In conjunction with freight airlines and freight trains, commercial trucks serve to transport the vast majority of goods from coast to coast. Obviously, it is advantageous to transport these goods in as large a container as possible – hence the eighteen wheeler semi-truck. Unfortunately, transportation via these vehicles carries with it risk, and it is this risk that can result in, sometimes horrific, accidents. Injuries sustained in commercial truck accidents make it necessary to engage the services of a personal injury attorney. Recently, a Brevard County Sheriff was killed when a tire retread failure caused an eighteen wheeler to swerve into the Sheriff’s vehicle. A discussion of the dangers posed by retreads and other tire failures of commercial trucks, and the basis for holding the commercial truck owner liable for damages caused, will follow below. Damages – The plaintiff was harmed or injured as a result of the defendant’s action (or inaction). Referring specifically to the situation that caused the death of the Sheriff, above, it is first important to know that tires on commercial trucks are a major expense. Designed to take a tremendous amount of wear on the road over long hauls and under great stress, tires do require maintenance and replacement, or the risk of tire failure rises. One way some companies try to save money is by using retreads. Retreading is a form of tire remanufacturing. Since the tread of a typical tire is typically the first part of the tire to wear down, although the body of the tire may still be serviceable, retreading allows the body of the tire to be recycled, by removing the worn tread and replacing it with new material. However, these tires are made so that if the new material wears, it will detach itself from the body. In some cases, though, they can cause the driver to lose control of the commercial truck, which can lead to accidents such as that described above. 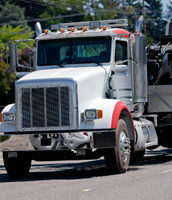 Commercial truck drivers and commercial truck companies are legally required to thoroughly inspect their trucks before driving, but if the driver is lax and doesn’t regularly inspect and replace worn tires, or the company fails to maintain the truck properly, a personal injury attorney should be able to help an accident victim recover any just compensation for damages. If you or a loved one sustained an injury due to a tire blowout from a commercial truck, contact the attorneys at Pita Weber Del Prado as soon as possible. We have experience in dealing with these types of commercial truck accidents, and will work with you to get you the compensation you deserve. Contact our Miami office today for an initial consultation.